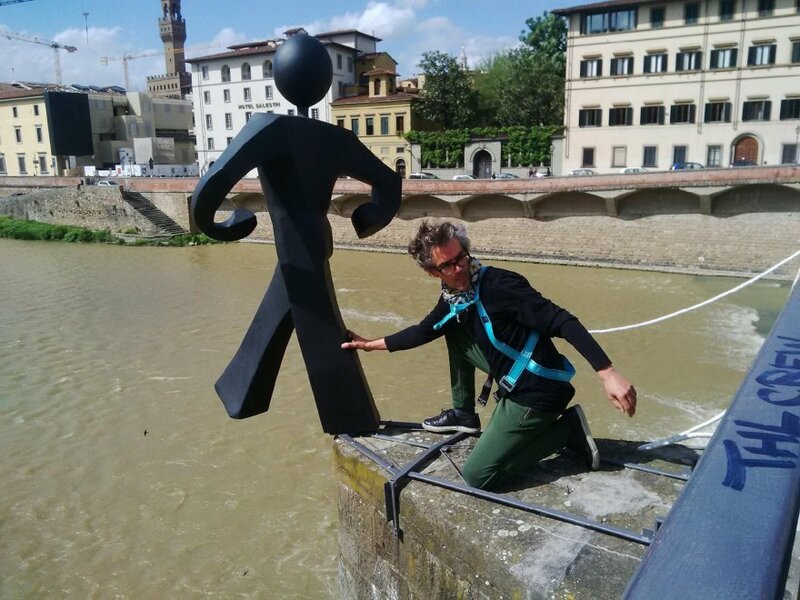 "You never know what new artistic surprises are going to pop out in front of you in Florence." These are the words I wrote on that cold winter night 5 years ago when I first discovered Clet's statue while taking a walk across the Arno. And blogged about it here: Momentary Art. 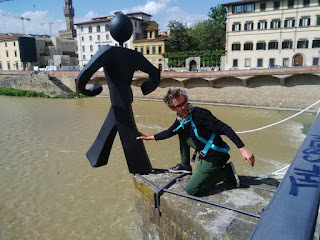 Today I couldn't believe my eyes, as I caught sight of him "hanging out" on the Ponte alle Grazie as if he never left home. A sense of joy and homecoming overwhelmed me. He's back where he belongs! It was a cold winter night in January 2011 when I first discovered Clet's now internationally famous Florentine masterpiece. On that night the statue had been illegally installed only hours before I first spotted it. Since then, the installation was not only legally challenged but sadly battered, spray painted, pissed on and vandalized until finally, the old man died and I thought he would never be resurrected again. Florence mourned his death. To me, the statue's resurrection represents resilience and change in the style and feel of Florence where now, people visit more than live. Today I smiled as I watched tourists snapping shots of the statue who don't know his history just like regardless of how much I study I will never know the history of the art which surrounds me in Florence because I did not live through it. How exciting it must have been to live here during the Renaissance watching art coming alive in front of you every single day.